Festival season is nearly upon, and for those of our parish who prefer their music heavy and their festivals heavier, there's only one place to be seen this June: Download. 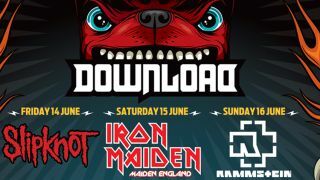 Taking place on 14 - 16 June and boasting a lineup that includes Slipknot, Iron maiden, Rammstein, Queens Of The Stone Age, Motorhead, Korn and plenty more big-name heavy hitters, this year's Download is squaring up to be a cracker - and we're giving away two pairs of guest area tickets. Not bad, eh? All you need to do is visit our competition page, fill out your details, answer the question, then cross your fingers and wait. We've got two pairs of tickets to the festival that include entry, camping and access to the Download Guest Area, an exclusive area within the festival site which the winners will have unlimited access to during the festival and even after the main arena closes which is home to undercover facilities, toilet trailers, private cash bars, dining options and much more besides. For more information, visit the official Download site, and check out the full lineup below. The competition closes on 31 May - good luck!